Today in Masonic History we discuss Gormogon. Gormogon was a short lived 18th century society that is believed to have been formed by an expelled Freemason. The beginnings of Gormogon, in a sense, started at a session of the newly formed Grand Lodge of England. 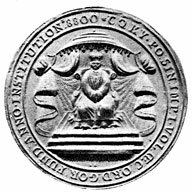 Phillip Wharton who became the Grand Master of the Grand Lodge of England in 1722 is believed to be the founder of Gormogon. In 1723, at a Masonic session, he tried to make it that the Grand Master could not appoint his Deputy Grand Master and that it would be an elected position. When the membership refused, the minutes of the session state "The late Grand Master went away from the Hall without Ceremony." Which essentially can have two interpretations, either Wharton declared the meeting closed and resigned his position without being properly relieved by the a new Grand Master or Wharton was relieved of his position as Grand Master. Regardless of which method mentioned before was the actual reason, Wharton left the fraternity in 1723. The following year the first mention of Gormogon appeared in the London Daily Post. In the announcement for Gormogon, it was claimed that Gormogon was a society that was started in China "thousands of years before Adam." It claimed that the society was started by Chin-Qua Ky-Po, that article claimed he was the first emperor of China. The first emperor of China was Qin Shi Huang and lived between 260 B.C. and 210 B.C. The article also claimed that Freemasons were not welcome unless they were willing to leave the Masonic fraternity and be "degraded." Later there would be indications that being "degraded" meant burning your apron and white gloves. That same year a letter appeared announcing that a prominent Freemason had left the Masonic fraternity and joined Gormogon by being "degraded." It is presumed that Wharton was the prominent Freemason mentioned. Little was heard from the Gormogon organization until 1728, when an article appeared announcing a meeting of Gormogon. This was a year after Wharton had been charged with High Treason for supporting the King of Spain during the 1727 siege of Gibraltar. Wharton would not return to England for the rest of his life for fear of being put on trial. Wharton passed away on May 31st, 1731. After his passing there were no further announcements or articles concerning Gormogon. Although a poem written by Tim Bobbin which first appeared in 1757 has a dedication to Gormogon and seems to imply that Bobbin was a member of the order, although no records remain. There is a Gormogon medal that still exists and is in the British Museum. Gormogon found new life in pop culture. In 2007 the Fox drama Bones did a season long story arch involving Gormogon. The first episode of the season titled "The Widow's Son in the Windshield" established a serial killer, that they called Gormogon. The killer would take an apprentice to teach them the craft of killing individuals involved in fraternal organizations like the Freemasons and Knights of Columbus (the first victim of Gormogon's apprentice was a member of Knights of Columbus). The storyline on Bones had no relation to the actual Gormogon organization, with the exception that both the fictional Gormogon and the real Gormogon both targeted Freemasonry. According to Cassell's Dictionary of Slang Gormogon is a contraction of the words gorgon and dragon. The Oxford English Dictionary describes the etymology as "meaningless: pseudo Chinese." In the end the objective of Gormogon was meant to hold Freemasonry up for ridicule.